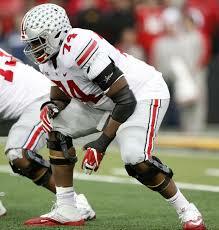 Jamarco Jones is a stalwart at Tackle and has been a serviceable starter during his tenure at Ohio State. At 6’4″, 299 lbs, Jones is a bit undersized, but with the right strength and conditioning program, he could grow into a bookend on an offensive line somewhere in the NFL. A lot of scouts have Jones lower than he should be, but it will just motivate him as he grows accustomed to the NFL life at OT. He is certainly not a day one starter, but he could blossom into one in the future. All he needs is a chance.